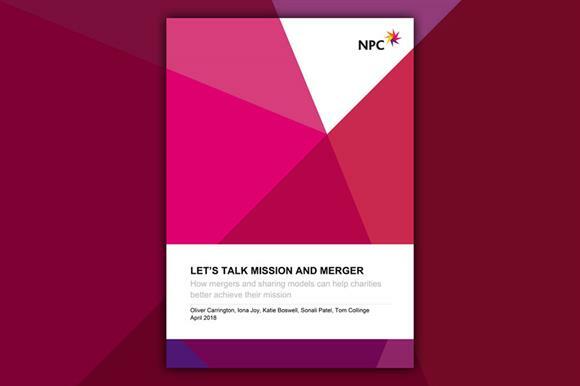 The Charity Commission should force trustees to consider mergers more seriously, according to a report published today by the think tank NPC. Let's Talk Mission and Merger says many charities could achieve more for beneficiaries if they merged, yet refuse to do so. They often regard merger as a sign of failure, are deterred by the financial and legal challenges and are guilty of putting survival above mission, according to the report. It urges the commission and funders to do more to tackle this and says recent regulatory changes have helped. The 2017 Charity Governance Code, drawn up by a steering group of sector bodies and adopted by the commission, includes a merger clause that urges trustees to "at least annually seriously consider the benefits to their mission of partnership working, merger or dissolution". The report says: "The commission should look at a small sample of cases each year and test how the requirements are being fulfilled with a view to further action if this proves that it is not working as desired." It also argues that larger charities should be asked to say in their annual reports whether they have followed this guidance and, if not, why. The commission, it adds, should publish analysis of the structure of charity sub-sectors so that organisations can assess possible duplication and consider consolidation. The document highlights recent regulatory developments that have smoothed the path to merger. They include last month's announcement by the Department for Work and Pensions that it plans to introduce an amendment to pension regulations, which should reduce the barriers that previous draft regulations might have created for mergers between charities with multi-employer pension scheme debts. Another development mentioned in the document is the Law Commission report Technical Issues in Charity Law, published in September, which recommends removing legal barriers to the merger of charities. Funders, the report adds, should provide unrestricted funding to charities to help them consider mergers. "Organisations such as the Association of Charitable Foundations should also push the agenda by encouraging supportive funding practices," the document says. The report is based on more than 50 interviews with charities including Breast Cancer Now, St Mungo's and Catch22, all of which have been involved in mergers or explored different ways of working together. Merger benefits highlighted include: a stronger voice, being able to reach more beneficiaries and efficiency gains, the report says. Report author Iona Joy, head of charities at NPC, said many charities were unaware of the diverse models of partnership working that were available. "The debate about mergers is polarised thanks in part to a perception that mergers equal takeovers," said Joy. "We hope our report will change that and turn the debate into a more constructive discussion of what is best for causes, rather than a narrow argument about the rights and wrongs of takeovers." Dan Corry, chief executive of NPC, said the report "eliminated a lot of the excuses trotted out to stop charities from even considering mergers". He added that charities, boards, funders and regulators needed to embrace the potential of mergers.